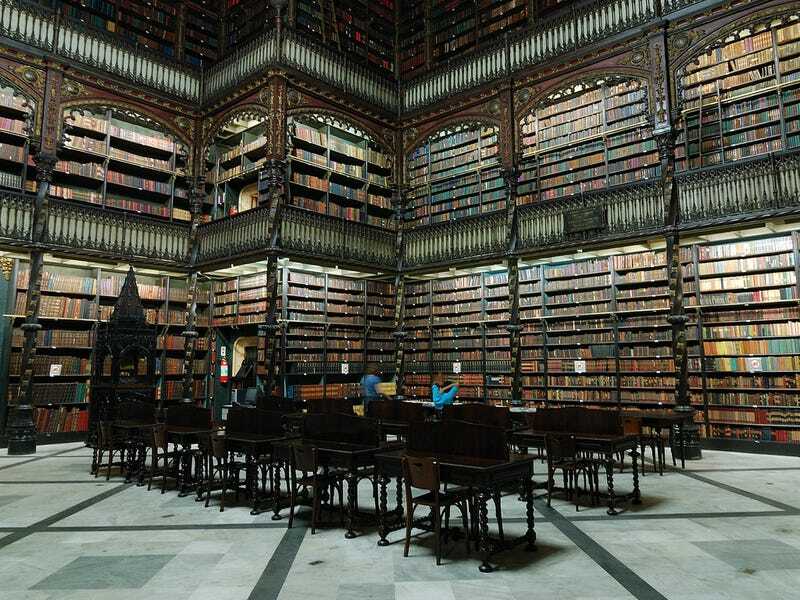 The doors of this massive library were opened in 1900, bringing a nearly endless collection of Portuguese texts to readers in the capitol of the empire. The cabinet was founded in the early 1800's by a trio of Portuguese immigrants who wanted to bring their country's culture to the Brazilian capitol. The collection's current home was built in the 1880's specifically to house their growing collection, and was designed to evoke a Gothic-Renaissance chapel. At 350,000 titles, the collection soon became the largest collection of Portuguese works outside of Portugal itself including rare original manuscripts, singular works of literature, and unique proofs. Today the collection receives around 6,000 new titles a year and the collection is rising towards 400,000 volumes. The walls are lined with rising strata of stacks creating one of the most fantastical atmospheres in the world. There are also paintings and other pieces of Portuguese cultural ephemera contained in the collection making it not only a jaw-dropping library, but a vital accumulation of Portugal's history.